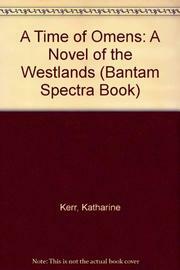  Sixth of Kerr's Celtic/elf/reincarnation/magic novels of the Westlands (A Time of Exile, 1991, etc. ), in which the author weaves numerous past and present narrative threads primarily, one is obliged to conclude, to disguise the inadequacy of the plot. Here, the powerful dweomer-master (magician) Jill journeys among Bardek's remotest islands to search for the meaning of a riddling inscription on a ring belonging to the half-elven King Rhodry of Deverry. In so doing, Jill contacts Dallandra, an influential once- human sorceress who has lived on the etheric plane for centuries. Dallandra's lover, Evandar, is a Guardian, one of a highly magical, mysterious nonhuman race that exists only on the etheric plane. It transpires that the Guardians are caught in some sort of astral trap, possibly self-made, wherein they are doomed to dwindle and vanish--unless Dallandra can enlist Jill's help in translating the Guardians from the etheric plane to the mundane, a move that will save them but which many Guardians are most reluctant to make. A slender plot padded out with the usual reincarnational forays into the past: adequate for undemanding series fans, tediously self-referential for everyone else, and not nearly distinctive enough to break out of the mold.